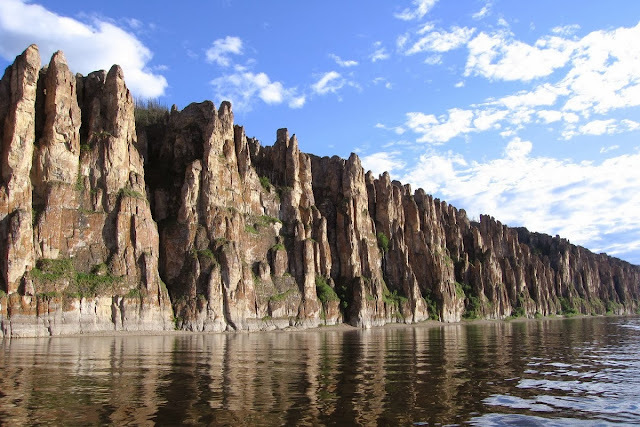 Lena Pillars, also known as Lena’s Stone Forest, is a natural rock formation along the banks of the Lena River in Russia. 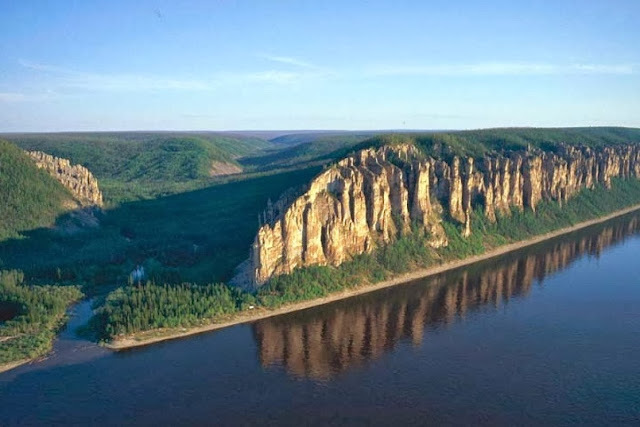 The pillars are 150-300m high, and extends along the river for about 80km. 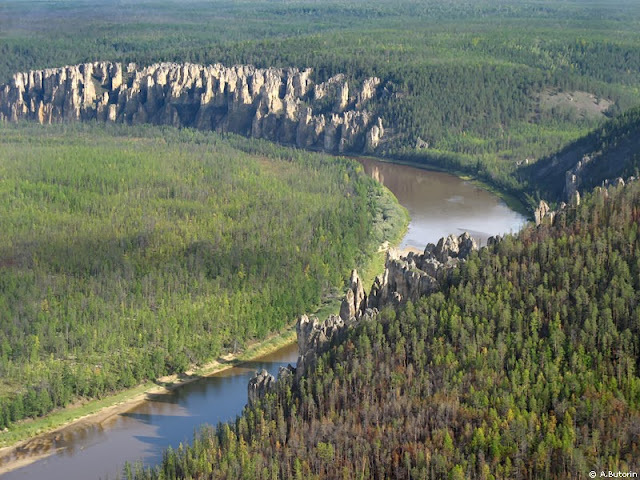 The Lena Pillars National Park was inscribed on the World Heritage List in 2012. The pillars themselves consists of the alternating horizons of limestone, marlstones, dolomites and slate of the Lower/Middle Cambrian, which are weathered in such a way that it produces the rugged outcrops. These types of rocks are commonly formed in marine environments and the horizontal layering and vertical variation indicates marine transgression/regression; with the slate representing the deep marine, slightly metamorphosed shales. Lena Pillars contains outstanding evidences of the Earth and its living population development history. Numerous fossils of ancient organisms found here are unique preserved evidences of a very important stage in the history of the organic world and a biodiversity "boom", that occurred in lower Cambrian epoch. Also in Lena Pillars area the fossils of mammoth fauna representatives were found: mammoth (Mammulhus primigenius Blum), bison (Bison priscus Boj), fleecy rhinoceros (Coelodonta antiguibatis Blum), Lena horse (Eggus lenensis Russ), Reindeer (Rangifer tarandus L).